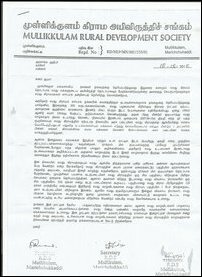 Rt Rev Cardinal Malcolm Ranjith, the Sinhala Archbishop of Colombo, Tamil National Alliance (TNA) leaders, Northern Provincial Council (NPC) and the civil organisations in Mannaar district should demand the Sri Lankan State to fully de-militarize Mu’l’lik-ku’lam GS division of Musali division in the district in 2016 and enable more than 1,200 Eezham Tamils, who were uprooted from their village in September 2007 to resettle in their village, said the representatives of the uprooted Tamils, who have not received any response for their repeated appeals in 2015. The villagers talking to TamilNet in December 2015 urged the concerned stakeholders to come forward in demanding full de-militarization of Mu'l'likku'lam in 2016. The villagers managed to mark the dawn of 2016 at their own church in Mu'l'lik-ku'lam on January 01. 30-year-old Amalathas Croos and 70-year-old Antony Lambert told TamilNet that the uprooted people had done all they could in articulating their demand. As they remained insistent on their demand, the then SL Defence Secretary Gotabhaya Rajapaksa proposed to create a modern village by clearing the jungle near their original village. Cardinal Malcolm Ranjith was witnessing it. But, nothing has taken place, they said. Following the regime change in Colombo, SL Minister D.M. Swaminathan visited the village in 2015, again promising resettlement arrangements. Nothing has happened despite these promises or the claim of ‘good governance’ in 2015, the uprooted villagers complain. 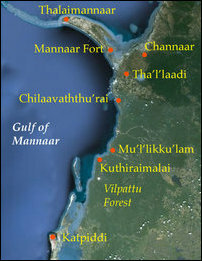 The majority of the Tamils from Mu'l'likku'lam are Catholics. 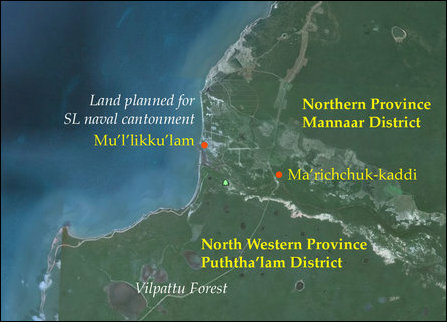 After uprooting the Eezham Tamils, the occupying SL Navy has transformed Mu'l'lik-ku'lam into the Command Headquarters of the “North Western Naval Area” of the occupying Sinhala forces. Not a single perch of residential areas has been released back to the people. The houses, church, jetty, school, playground and cemetery are still under the complete control of the SL Navy. The villagers, displaced from Musali, have been temporarily staying in Peasaalai, Thaazhvup-paddu, Keeri and in Thalaimannaar and have been subjected to various harassments by the SL military throughout the last eight years. Since their eviction, the people of Mu'l'lik-ku'lam have been continuously protesting and demanding return to their village for resettlement. Around 350 people belonging to 176 families, who moved closer to jungle outlets near Mu'l'likku'lam, at Malang-kaadu and Kaayaa-kuzhi, are languishing for three years without basic facilities, the uprooted Tamils complain. Kaayaa-kuzhi belongs to Ko'ndaichchi GS division. 53 acres of the lands in the military-seized Mu'l'lik-ku'lam belong to Roman Catholic Diocese of Mannaar. 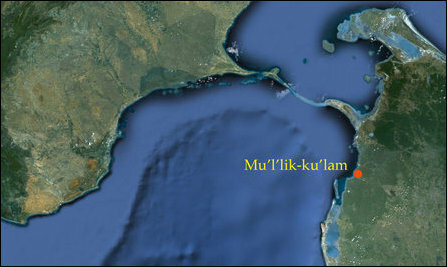 The people of the coastal village were having access to resourceful fishing beds and fertile agricultural lands in Mu'l'lik-ku'lam before 1990 and during the ceasefire between the LTTE and Colombo from 2002 to September 2007. There were more than 300 families resettled in Mu'l'lik-ku'lam after 2002, village leaders told TamilNet. There were 274 houses in the village. 25% of the houses were cadjan huts. Apart from the cadjan huts, the stone buildings are all intact, they added. The occupying Sri Lanka Army handed over the village to the SL Navy in 2008. Now, 26 houses of the large houses that belonged to the villagers are being used by the SL Navy as residential offices for naval commanders and for other military purposes. After the families moved closer to Mu'l'likku'lam, the SL Navy constructed 27 stone houses for the owners of the 26 houses. But, these houses are already damaged due to poor construction, the uprooted people said.